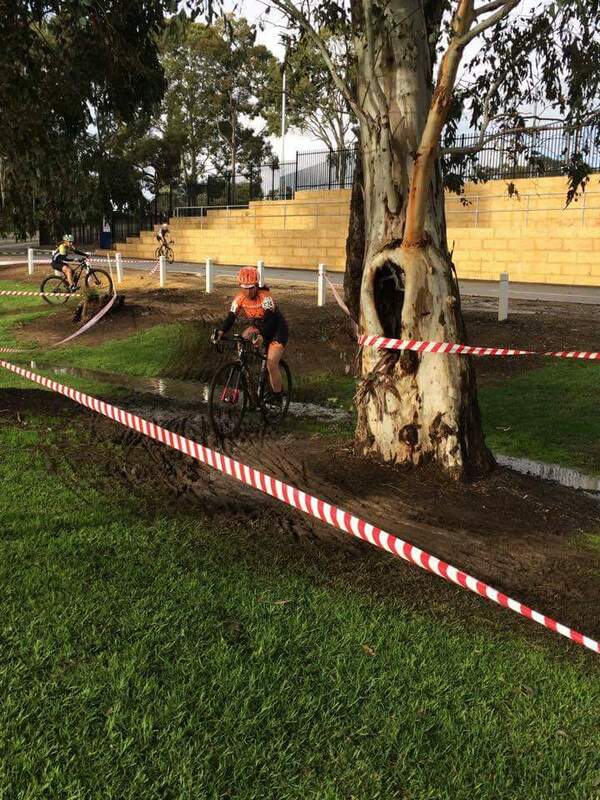 Round three of the Numbat Cup Western Australian Cyclocross series was held on the oval at Guildford Grammar school. This round is referred to as “Swamp Rat”, and after racing it I can see why! A site perched on the edge of the river does lend itself towards mud – particularly when we’ve had over 40mm of rain in the past four days! 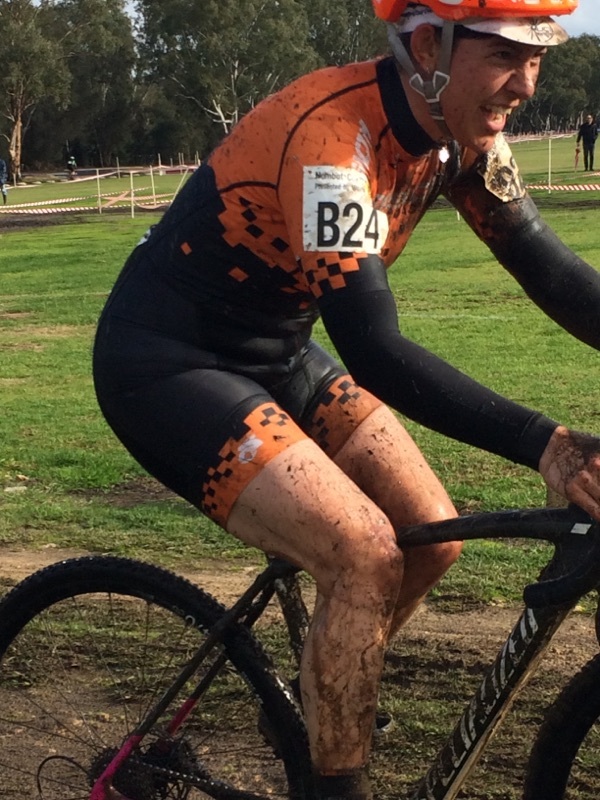 I started cyclocross racing this year, for fun and to build my skills for road and mountain bike. 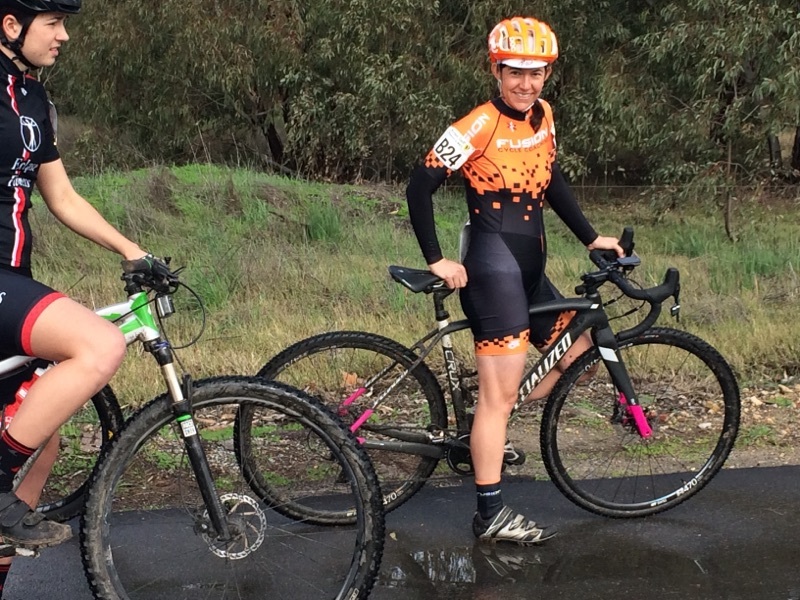 Now it is my favourite kind of racing and I love using my bike for gravel riding. In my second race I was 5th out of 11, and I was 4th out of 11 in my previous race. My goal this time was the podium, plus to beat those riders who were close to me in ability. I have a pretty handy sprint, so my tactic for the start was to sprint hard and get a good line into the first few corners. It was a good start for this – 50m on bitumen, then through a big puddle and onto the grass, then into the corners. I think my start was ok – I may have been in slightly too easy a gear initially, so even though I changed up through the gears quickly, I didn’t get in front of everyone. I was probably equal first coming into the big puddle. Then one or two more came past me in the first series of corners, so after we settled down I was in 4th place. It took me only about a quarter of a lap to catch and pass the lady who was in third place, plus a couple of the elite women who had started about 20 sec ahead of us. One lap was 2.8km and took me 11-12 min. By halfway through the first lap, I could see the two other B grade women plus one of the elite women in front of me. Then I got past one of the B grade women and there was only one B lady in front of me. She was sitting behind the elite lady. This was the closest I’d been to other riders in a cyclocross race, generally the field spreads out quite quickly. The other two riders in my sights were still about 50-100m in front of me. The second half of the course was more technical, with tight muddy corners, steep banks with puddles in the middle, and a really cool spiral. I was able to benefit from watching their lines through some of the tricky muddy corners. 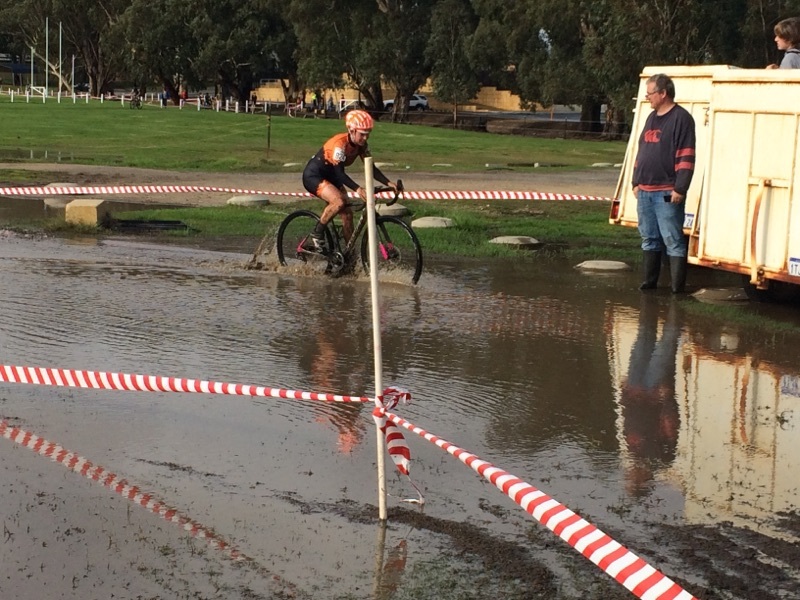 Then the area coming back to the start line was basically a huge puddle! It took me until the second lap to get up close the two riders in front of me. I was thinking I should be a bit tactical and sit behind the other B grade lady to catch my breath and then choose my moment to go past. But then I got up behind them and my speed difference was high enough that I just went straight past – otherwise I would have had to slow down to ride at their speed! Plus this way I could choose my line through the course. So I kept the power down and tried to ride away from them. Halfway through this second lap, I saw that I had a gap but the other B grade lady (Dharlia) was chasing me. The elite lady was nowhere to be seen. So I kept pushing hard. Then I got to the hardest obstacle – a steep bank with a couple of large deep puddles leading into it. The puddles were rideable – but this time through, my front wheel found a tree root in the puddle and I went over the handlebars and straight into the mud bath! Lots of onlookers asking if I sad okay – good thing the answer was yes. By this time, Dharlia had re-passed me. So I grabbed my bike, climbed up the muddy bank, and jumped back on. Funny thing was that within 50m I had already overtaken Dharlia! She must’ve been so shocked to see me coming past her again! Through the huge puddles and around the spiral – I took an outside line around the spiral, through the grassier bits, which ended up being faster. Then onto lap number three! This is where my recollection gets a bit blurry. I think we did 3.5 laps (the finish line was halfway around from the start). Anyway, I kept riding as hard as I could but by this time I was starting to get tired. I still had a gap on Dharlia, around 30m. But as we came to the last third of the lap she got quite a bit closer. I could almost feel her breathing down my neck. I was telling myself – slow is fast, pick the right line, use those legs, keep the pedals turning, keep concentrating. I tried to take all the best lines, and as soon as I got traction out of the mud or puddles I’d put the power down hard. Well the hard work all paid off as I managed to keep in front of her all the way to the finish line, and I was so relieved to hear them say that it was our last lap, we were all done. I think we rode for just under 40 min, and as B grade is supposed to do 40 min I was worried they’d send us out for one more! I really enjoyed this race and the circuit. 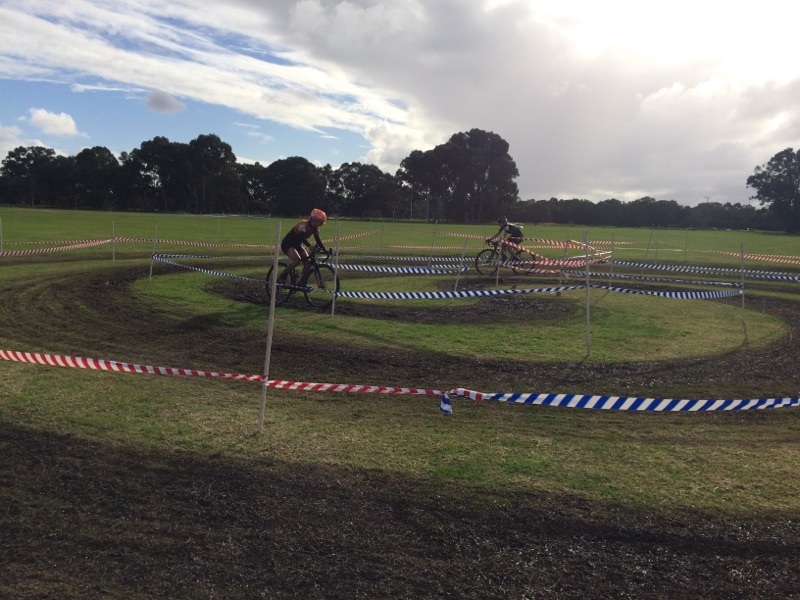 Mr Cyclocross in Perth (Stuart) said he thought this was the hardest course we’d built in Perth! It was tough and I’ve got the bruises and scrapes from my little crash to prove it! 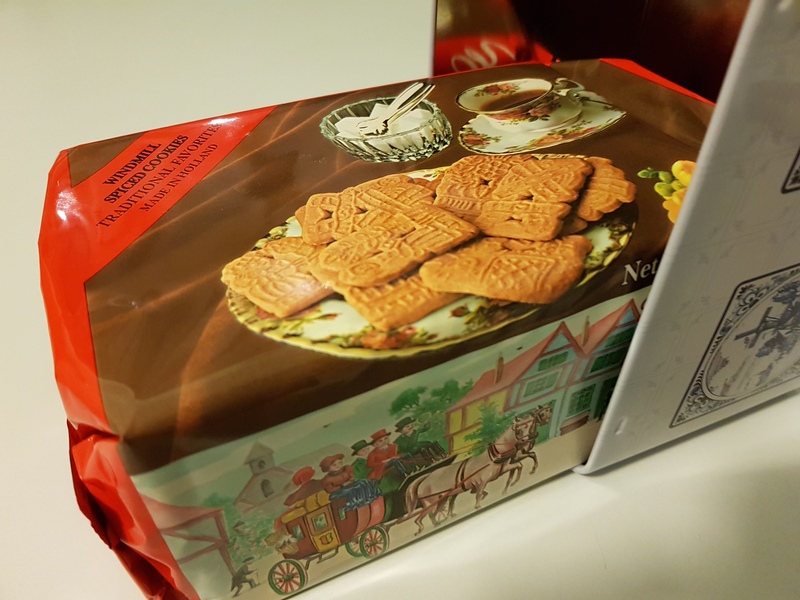 It is not about the prizes though. It is a little bit about the glory and my competitive nature. But it is mainly about having fun and a great supportive atmosphere! 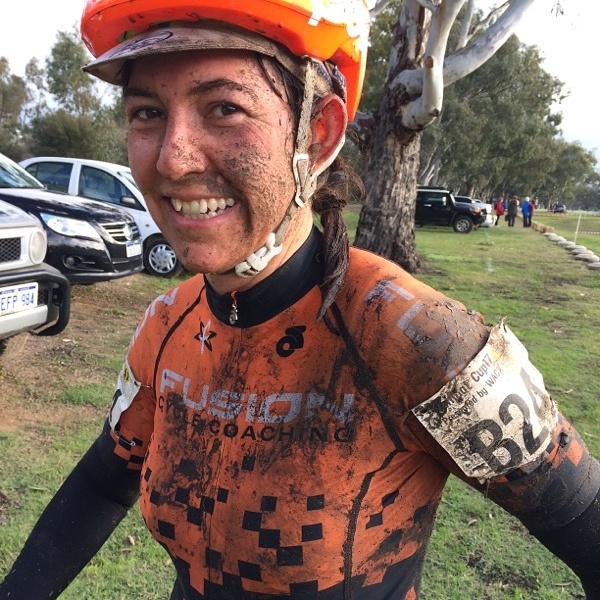 So if you want to have fun riding and get a really hard workout, get out and do a cyclocross race!